Still open - a short length of the low up platform survives adjacent to the crossing. Notes: The London & North Western Railway opened Wootton Pillinge station in 1905 to cater for the new rail-motor service between Bletchley and Bedford which began on 1 December 1905. It was one of seven new halts. Company records from 1905 show an eighth halt called Brickyard Halt near Wootton Pillinge but this never appeared in a public timetable and there is no further reference to it. The halt served the small village of Wootton Pillinge, a largely rural community that, in 1897, had become the site of B.J.H. Forder's brickworks. The works was served by sidings close to and alongside the halt which were controlled by a signal box. As built the halt was very basic with a 50ft low platform constructed of old sleepers at rail level with a nameboard and one oil lamp but no shelter. The rail-motors were fitted with folding steps for passengers boarding or alighting at Wootton Pillinge. Along with the other rail-motor halts on the Bedford - Bletchley line, during WW1 Wootton Pillinge closed on 1 January 1917 as an economy measure. The halt reopened on 5 May 1919. By 1910, the Wootton Pillinge Brick Company was selling 48 million bricks per year and in 1923, it merged with the London Brick Company (LBC). The brickworks developed virtually across the railway line and as the wagon capacity of the old sidings was exceeded, they became an extension for a larger group of sidings developing at Wootton Broadmead. The Wootton Pillinge signal box was closed and a new box was opened called ‘Forder's Sidings’ which controlled heavy movements from the works. In 1926 the LBC began to build a ‘garden village’ for its employees at Wootton Pillinge; the village was to be named Stewartby after Sir Halley Stewart, the former Liberal Parliamentary candidate for Peterborough and first chairman of the Wootton Pillinge Brick Company. Following the building of the village, Wootton Pillinge ceased to be a halt from 1 January 1928 and the LMS renamed the station Stewartby on 8 July 1935. The original sleeper platforms were replaced with concrete paving before any of the other halts on the line were rebuilt. A timber waiting shelter was provided at the south end of the down platform, adjacent to the crossing. Tickets were sold by the crossing keeper and a small ticket window was installed in the keeper’s hut. As the Wootton Pillinge signal box had closed a new external lever frame was installed by the LMS adjacent to the crossing keeper’s hut in the early 1930s. 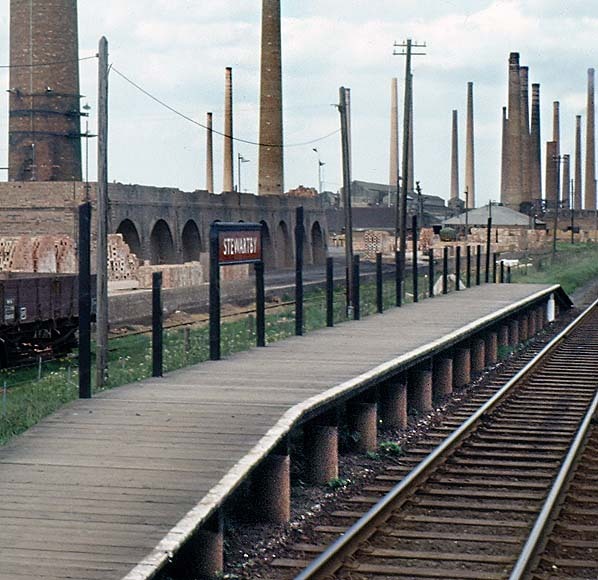 The Stewartby brickworks was connected to the Marston Vale line via a 2 ft 11 in narrow gauge railway operating on overhead electrification. This is believed to have been installed in the 1930s and it lasted until 1960. With the introduction of DMUs in 1959, the low platforms were replaced with longer conventional height platforms built from timber. 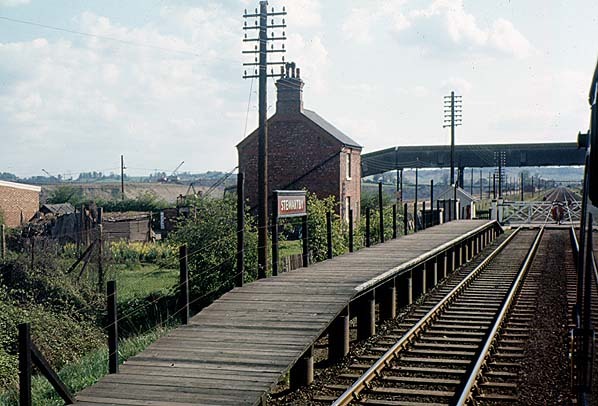 Stewartby station became unstaffed from 15 July 1968. After reaching a peak production level of 738 million bricks in 1973, demand for the product declined and the LBC (trading as Easidispose) signed an agreement the following year to re-use its empty clay pits for landfill transported from London. One or two daily container trains began transporting 1,000 tons of waste from Hendon to handling facilities at Stewartby. 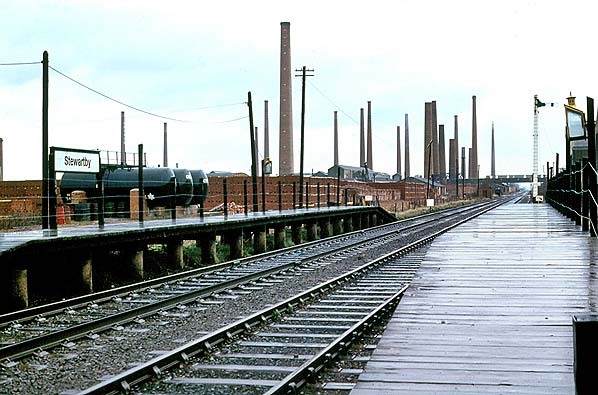 Stewartby was one of the last stations un the UK to retain oil lighting; the lights not being replaced until some time after June 1981. The London Brick Company was acquired by Hanson plc in 1984. More than £1 million was spent on Stewartby Brickworks in 2005-7 in an unsuccessful attempt to reduce sulphur dioxide emissions. In February 2008, Hanson closed brickmaking operations at Stewartby even though it met the EU regulations; production of the London Brick is now concentrated at Peterborough. The four chimneys remaining were due to be demolished upon closure but they have since been listed for preservation of Bedfordshire's brick-related history and will remain. Much of the Marston Vale site is being redeveloped for housing although some buildings remain and the new Hanson HQ building is also located there. A new signalling control centre was built at Ridgmont as part of the Bedford — Bletchley route modernisation in 2004. This centre replaced all the signal boxes on the route, and the level crossing gates were replaced with lifting barriers at that time. The original gates had previously been replaced with new metal gates in the 1980s. As part of the route modernisation the 1959 up platform was replaced with a new platform on the south side of the level crossing. The reason for staggered platforms is to avoid road traffic being held up by trains waiting at the platform before proceeding over the crossing. Stewartby, in common with others on the Marston Vale Line, is covered by the Marston Vale Community Rail Partnership, which aims to increase use of the line by involving local people. Services are operated by a Class 153 single-car diesel multiple unit and a 2-car class 150 unit. The MVCRP encourages local communities to ‘adopt a station’ by setting up a group of people to look after, and improve, the stations. Stewartby has yet to be adopted. Stewartby is the nearest station to the Marston Vale Millennium Country Park. Click here and here to see a short film of the demolition of three chimneys at the Stewartby brickworks in 2007 and another showing stills of the derelict works. A group of local businessmen first promoted a line to Bedford in 1844. The proposal was supported by engineer George Stephenson. A public meeting was held on 23 April 1844 where there was some discussion about where the line should form a junction with the London & Birmingham. Stephenson was keen that the junction should be at Bletchley and although there was spirited opposition his proposal was eventually accepted. During the construction of the Bedford line, the London & Birmingham Railway amalgamated with the Grand Junction Railway to form the London & North Western Railway who took over the running of the line. Intermediate stations from Bletchley were Fenny Stratford, Ridgmont, Lidlington and Manston (later renamed Millbrook). The line opened on 18 November 1846; the line from Oxford - Bletchley opened on 20 May 1851. The final link from Bedford to Cambridge opened on 7 July 1862 provided an important cross-country line between Oxford and Cambridge, forming one of the few east-west routes with the capability of reaching the east coast ports. Most services, however, ran from Oxford to Bletchley and from Bletchley to Cambridge. A rail-motor service between Bletchley and Belford was introduced on 1 December 1905. Seven new stations were opened at Bow Brickhill, Aspley Guise, Husborne Crawley, Wootton Pillinge, Wootton Broadmead, Kempston Hardwick and Kempston & Elstow. An eighth one called Brickyard Halt is shown in company records near Wootton Pillinge but this never appeared in a public timetable. Whereas the Great Western Railway named such additional unstaffed stations ‘halts’ the London & North Western Railway referred to them as ‘motor’ or ‘rail-motor’ stations, and subsequently there has been uncertainty about whether Bow Brickhill and the others should be called ‘halts’. The Ordnance Survey practice for the Bedford Railway motor stations was to identify them as halts until the London Midland Region ceased to use this suffix in 1968. The rail-motors were superseded by pull-and-push units which continued in operation until the introduction of DMUs in 1959. The Second World War intensified traffic on the line as never before. With the return of peace and the nationalisation of the run-down railway network the newly formed British Railways Board was looking to close unprofitable lines. In 1955 the Railway Modernisation Plan proposed improvements to cross-country facilities between Oxford and Cambridge with the aim of maintaining a link between the major main line railways outside the congested Greater London area thereby allowing freight traffic to be transferred between three railway regions and easing the burden on London marshalling yards. Within a few years the policy changed and the line was not upgraded with the Bletchley flyover remaining as a monument to the fruitless proposal. An attempt was made to close the Oxford - Bletchley - Cambridge line in 1959 but local pressure succeeded in winning a reprieve. There was some relief when Dr Beeching did not include the cross country Oxford to Cambridge line in his closure proposals in 1963, but just one year later the British Railways Board published closure plans for the whole route. The introduction of new diesel trains in the 1960s allowed British Railways to run much faster trains, and the need for a cross country service declined as passengers found it quicker to travel between Oxford and Cambridge via London. The lines between Oxford and Bletchley and Bedford and Cambridge closed after the last day of service on 30 December 1967; the section between Bletchley and Bedford remained open, although downgraded. 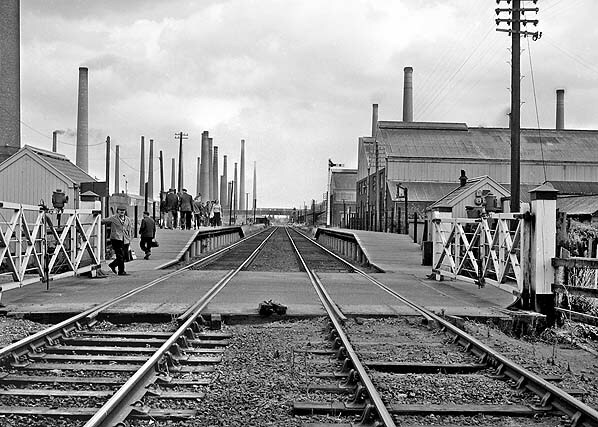 All of the stations lost their goods and parcels facilities, and every station except Bletchley became an unstaffed halt from 15 July 1968. Closure was once again proposed, and it was announced that the remaining section of the Oxford - Cambridge route would close in October 1972. There were numerous objections to the closure which was postponed until a suitable replacement bus service could be introduced. Once this was in place closure was announced for 31 December 1972. The Bedford Rail Users' Association was formed to fight the closure, and the opposition was so strong that British Rail was forced to postpone once again, pending an appeal by local groups. At this time government thinking on rail closures was changing and a grant was provided to maintain the service. With the development of the large new town of Milton Keynes, which incorporated Bletchley, the line began attracting new customers. In 1973 a 20-year contract between the Greater London Council and the London Brick Company assured the line’s future. The contract was worth £10m to British Rail who began operating block trains between new sidings at Stewartby and a new handling depot at Hendon. For much of the twentieth century this 16-mile line had a particularly distinctive character, its closely-spaced stations being either in the Gothic Revival style or diminutive halts. 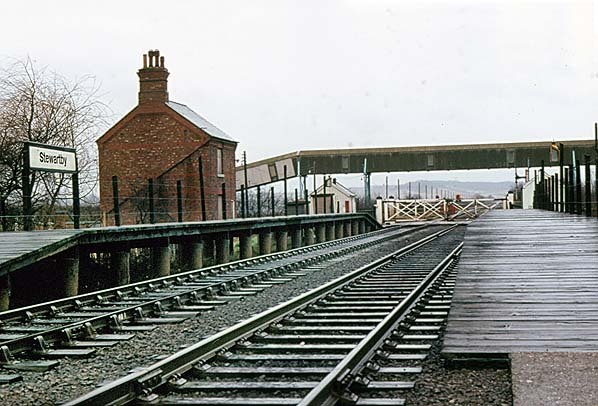 The numerous staffed level crossings also gave the line a certain charm; even in the mid 1980s the passenger would be aware of gate-keepers standing at each crossing as their train passed. The landscape was also distinctive between Bedford and Ridgmont as the route was hemmed in by forests of tall chimneys and massive clay pits. Nowhere was this more the case than at Stewartby. From 1968 until its replacement in 1984 on a new route into Bedford (Midland) the Bedford – Bletchley line had its eastern terminus at Bedford St Johns, an unstaffed ‘halt’ an inconvenient distance from the main line station. The Bletchley to Bedford line closed on 23 July 2004 for rebuilding. 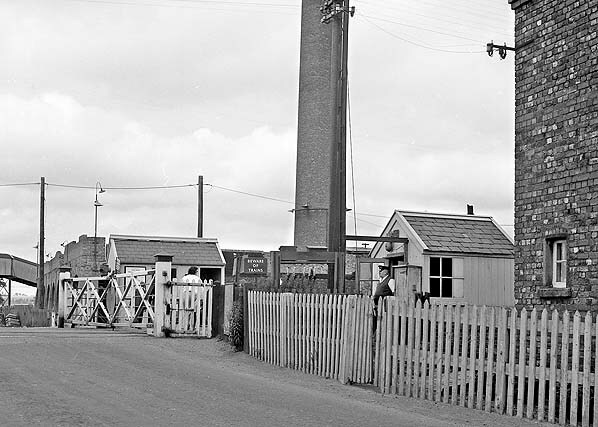 This included re-signalling, the replacement of crossing gates with lifting barriers and the staggering of platforms at Stewartby, Lidlington and Aspley Guise. The line reopened on 6 September 2004 controlled from new Marston Vale Signalling Centre and Ridgmont. The service is now operated by Marston Vale Community Rail Partnership part of London Midland who operate services on the West Coast Main Line from London Euston previously run by Silverlink and in the West Midlands previously run by Central Trains. The franchise was originally due to expire in September 2015 but in March 2013 was extended until June 2017. The Bedford - Bletchley (Marston Vale) Line is one of the two remaining sections of the former Varsity Line (Oxford - Cambridge) still in passenger use. In the 2011 Autumn Statement the Chancellor of the Exchequer, George Osborne, announced the allocation of £270 million for the East West Rail Consortium to reinstate the Oxford – Bletchley – Bedford section of the Varsity Line. The service will link the Marston Vale Line (calling at Bedford, Lidlington, Woburn Sands and Bletchley only) to Winslow, Bicester Town, Oxford and Reading. The Consortium hopes later to reopen the Bedford — Cambridge section, for which a new route may be required, possibly involving the use of the East Coast main line south from Sandy then the Hitchin – Cambridge line, with a new north-to-east chord just north of Hitchin. On 16 July 2012 the Coalition Government announced that the Marston Vale route would be electrified, as will the currently disused line from Bletchley to Oxford. This would form part of a wider 'Electric Spine' stretching from Yorkshire and the West Midlands to Southampton and South Coast Ports. 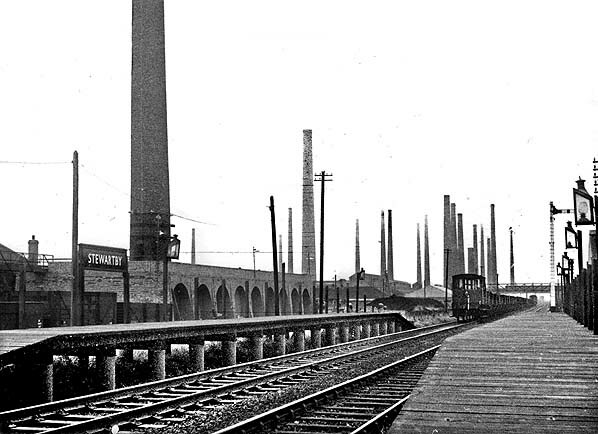 When the Wootton Pillinge Brick Company opened their works it was on the west side of the line but as production increased the works expanded with the railway running through the middle of the huge industrial site. 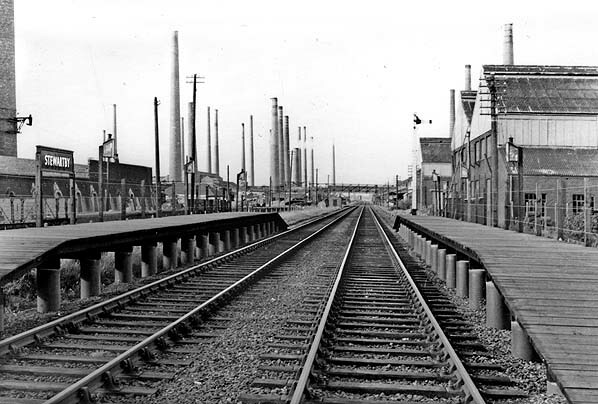 The works is approaching its peak production in this view looking north-east from the level crossing c early 1960s. The platforms were raised to standard height a few years earlier when the push-and-pull steam service was replaced with DMUs. 1886 1:2,500 OS map shows the Green Lanes crossing before the arrival of the halt or the brickworks. There is a crossing keeper's cottage to the east of the crossing. 1925 1:2,500 OS map shows the halt with two short platforms and no buildings. The crossing keeper's cottage, seen to the east of the level crossing, has been replaced with a new building by the LNWR. Wootton Pillinge signal box is seen to the north of the halt. This controlled access to the siding running into the Wootton Pillinge brickworks which had developed on the west side of the line. 1938 1:10,560 OS map. By this date the works had expanded to the north and east. All the original buildings of the Wootton Pilling brickworks have been demolished. With the expansion of the works the signal box closed and was replaced with a new box at Forder's Sidings which is off the map to the north. The new 'garden village' of Stewartby is shown between the old Wootton Pillinge village and the railway line. The village housing and town community centre was designed by the noted neo-Georgian architect, Sir Albert Richardson, with each house deliberately placed at an angle to its neighbour. Click here to see a high resolution map of Stewartby brickworks and village in 1960. 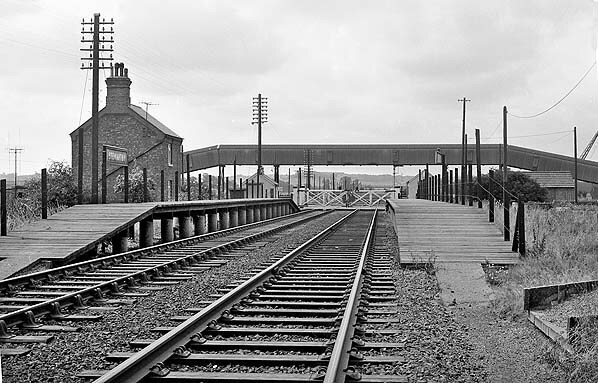 Stewartby station looking north-east in September 1967. The up platform is well lit with oil lamps placed at regular intervals; the down platform was not quite so well lit with only two lamps - there were four a few years earlier. The brick kilns are seen behind the down platform. There was a narrow gauge tramway operating on overhead electrification running in front of the kilns. This lasted until about 1960 and all evidence of it had been removed by 1965. By this date the kilns were loaded using forklift trucks. Stewartby station up platform seen from an approaching Cambridge-bound train in December 1967, a week before the Oxford - Cambridge service was withdrawn. The lever frame is seen bottom right between the crossing and the keeper's hut. Note the small ticket window to the left of the hut door. Note also a small section of the low platform in front of the hut; this was retained to avoid having to rebuild the hut when the platforms were raised. The original platform consisted of old sleepers but these were replaced with concrete paving slabs in the 1930s. 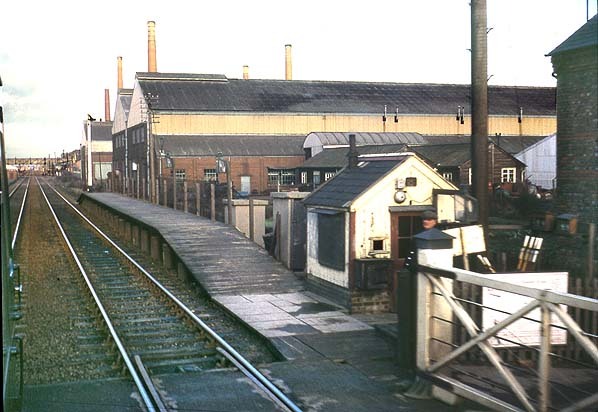 Stewartby station looking south-west c late 1960s. The platform lighting has been considerably reduced with only one oil lamp remaining on each platform. The crossing keeper's cottage is seen behind the platform. This is not the original cottage but a late nineteenth century replacement. It is very plain compared with other crossing keepers’ cottages on the line and follows the LNWR's standard design for company employees. A conveyor belt is seen crossing the line to the south of the station. This dates from the 1960s and runs to the new clay pits that were excavated at this time to the south of the station. Green Lane level crossing c late 1960s. The crossing keeper stands by his hut. The keeper was also responsible for selling tickets until 15 July 1968 when the halt became unstaffed. Note the timber waiting shelter on the opposite side of the crossing. Brick workers are seen arriving at Stewartby station to wait for the next train to Bedford St Johns c late 1960s. At this time there were 17 trains a day. There was an early morning (05.48) night shift workers’ train that ran non-stop between Bletchley and Stewartby. 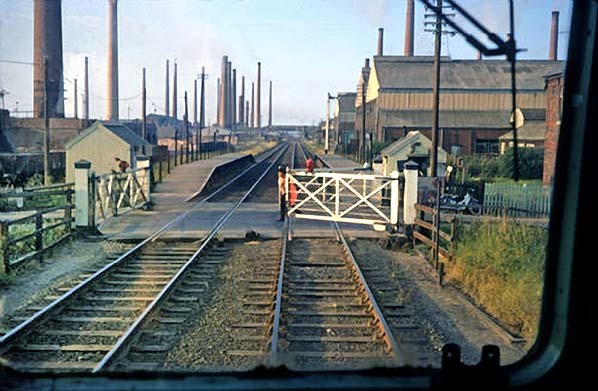 Stewartby station looking south-west from a Bedford DMU in May 1973. 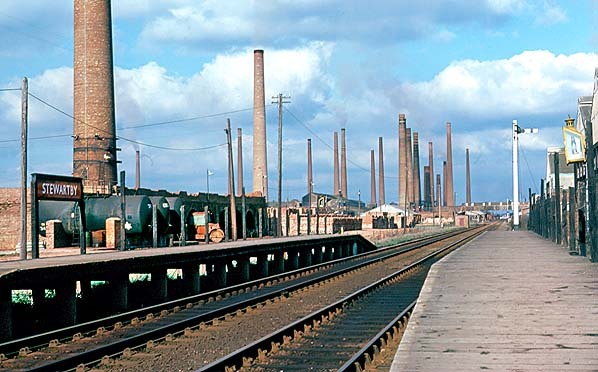 The conveyor belt in the background is the only evidence of the heavy industry that would be seen in the opposite direction. Stewartby crossing keeper's hut and lever frame in February 1977. Part of the earlier low platform is seen in front of the hut. The 'paytrain' poster on the notice board indicates that the station is now unstaffed. The crossing keeper sold tickets from the hut until 15 July 1968. Stewartby station looking north-east along the Bletchley platform in February 1977. 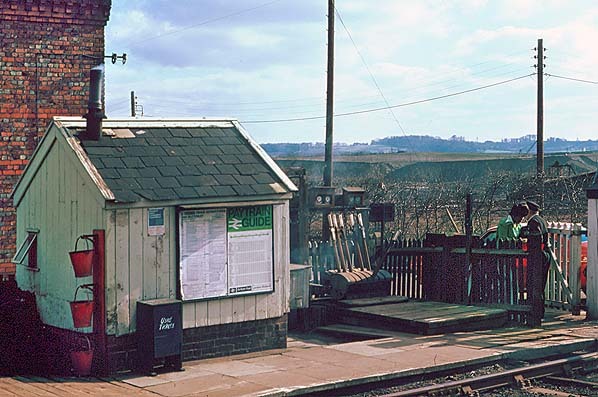 Stewartby looking south-west in March 1981. The station took on British Rail's Corporate Identity in 1977. At Stewartby that meant new white and black running-in boards and the reinstatement of two of the oil lamps on the original posts. This was one of the last BR stations in England to retain oil lighting. Stewartby station looking north-east from the up platform on a bleak, wet day in March 1981. By this date brick production at Stewartby was in decline. Three years later the London Brick Company was acquired by Hanson plc.